At There's Magic in the Air, Melanie brings us this weeks challenge to use any acquired Paper Cupcake image with the below sketch. I love this image of the Moss Covered Birdhouse and thought it would fit this sketch nicely. 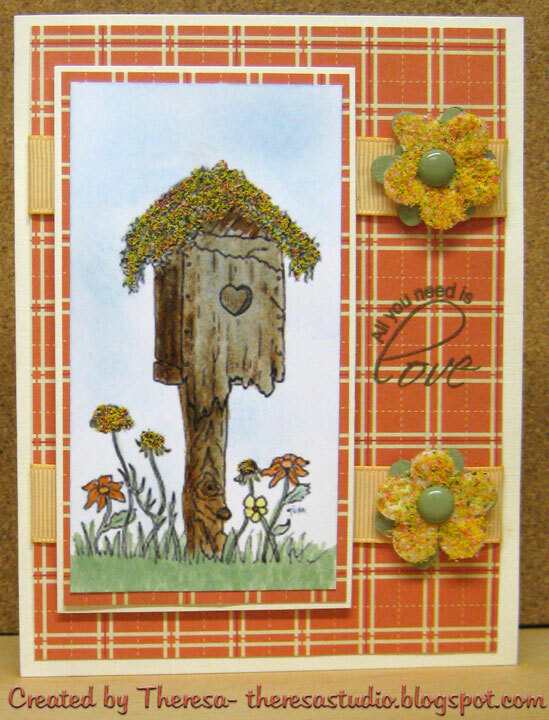 After printing the image, I colored with Copics, sponged the background, and added some citrus crush Flowersoft to the top of the birdhouse and some of the flowers in the image. Love the aged look of the house. 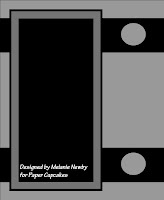 Used solid Ivory CS for base and mat under the image. Used an unknown plaid pattern paper for mats and added 2 ribbons with my flowers that I punched and covered with Flowersoft and added brads for centers. Used a rub on sentiment "All You Need Is Love" to finish. Beautiful Autumn Card Theresa - love how you colored this image! We're so happy to see you back this week! Thanks for playing! The flower soft looks just like moss -- fantastic idea! Lovely Autumn colours on your card, and super colouring of the image. Thanks for playing at Paper Cupcakes this week. Theresa, This is just beautiful with the gold flower soft and lovely fall colors with the oranges and sagie green! 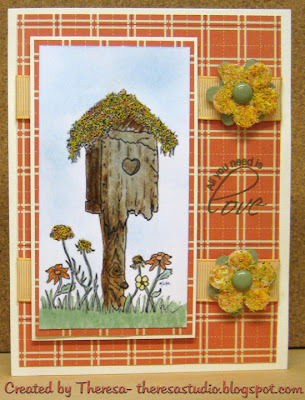 I love that flower soft on the top of the bird house as well as on the flowers... so lovely! Thanks for playing along with our challenge this week over at Paper Cupcakes! Hope to see you next week! How did I miss this one? You used one of my favorite images again... love the flower soft, perfect touch! Hey there girl, loving this card...one of my favs and you really did it justice. Thanks for playing at TMITA...we appreciate you!